A similar loading system existed for the big guns on British battleships. The Royal Navy had been very resistant to the idea of breech loading guns, citing weaknesses in the design of the Armstrong breech loading system. Even Armstrong himself doubted if his breeches would be strong enough for the very large guns being used on the new ironclad warships. Whilst this might have precluded the Armstrong system it should not have excluded the very concept of the breech loader there were plenty of other systems available. Nevertheless the Royal Navy was passing through a period of technical conservatism and standardised on Rifled Muzzle Loaders (RLMs). The problem was that some of these were very large with relatively long barrels. At the same time the armoured gun turret was being introduced (partly as a result of the development of the American Monitor class of vessels). As the guns became larger it became increasingly difficult to load them in the confines of the armoured turret. .Even when the guns had recoiled after firing there simply wasn’t room in the turret for a loading crew, complete with long rammers etc. to operate in front of the gun. At the same time the sheer weight of the shell made it very difficult to handle. One might have thought that at this stage the powers that be in the Navy would have recognised the inevitability of a move to breech loading. But no, there is almost no limit to the ingenuity some people will apply to retaining an idea whose time has passed. 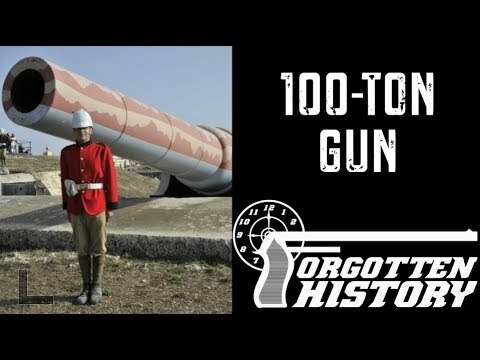 Turret guns would be loaded from outside the turret! The logic of protecting the guns, their layers and firers inside a massive armoured turret and leaving the equally vital ammunition and loaders outside is difficult to fathom. The procedure on ships such as HMS Thunderer was that after firing the turret would be rotated to face a break in the deck under which sheltered the loading crew. They would extend hydraulic rammers to push shells (and charges) into the twin cannon protruding from the turret. This being done the turret would be rotated back to face the target so that the guns could be fired again. A ponderous system and one that effectively split the gun crew into two parts with no effective means of communication between them. As any competent systems engineer will tell you this represents a recipe for disaster. And disaster there was. In 1872 during a practice firing session Thunderer’s turret fired and rotated for reloading, but one of the twin guns had misfired and there was still a round in the barrel. It has been suggested that the firing crew in the turret were unaware of this, if so it is difficult to understand why as one of the guns would not have recoiled on its slide and they would not have had to bring it back into loading position (which under the system being used was the same as its firing position). It is quite probable that they did know but that the message did not reach the loading crew who would see two guns both in the position for recharging, and so they re loaded both. Obviously the firing crew were unaware of this as they rotated the turret back to the target and fired both guns. The double charged gun exploded destroying the turret and killing all the firing crew and almost everyone who was on deck, including the loading crew. This was an accident that could not have happened with a breach loading gun as it would have been impossible to load a second round into a breach already occupied by an unfired charge. The disaster effectively signalled the end of the RLM in the Royal Navy's ships, henceforth they began development to adopt the rifled breach loading gun as standard. Most systems progress to their ultimate level before being discarded. Muzzle loaders were no exception, as the technology was well understood and capable of being scaled up a great deal by the means available at the time. Move forward into the 20th century, and the main drawback to Soviet tanks with auto-loaders was their need to "index" the main gun to a neutral level position in order for the auto-loader to function properly. Result: a system that fired more slowly than the old-fashioned American system of a strong guy in the turret hand -loading the shells. Despite this obvious drawback, it was some time before the Soviets were willing to give up their auto-loaders. Once an idea is adopted into use, it develops an inertia that can make it last well past its usefulness. However, the psychological value of a monster weapon often supercedes its actual military value. Witness the 800mm railway gun produced by Krupp during WWII. As an artillery piece, totally useless in every way, but as a symbol of German might and technology...out of this world.
. Witness the 800mm railway gun produced by Krupp during WWII. As an artillery piece, totally useless in every way, but as a symbol of German might and technology...out of this world. Rot. It was only symbolic for Hitler. Nobody else in Germany wanted Gustav (other than Krupp's shareholders). No -one else knew about it - just another of Adolph's wet dreams - he had a fascination with big weapons. During World War II the Germans were the main builder and user of giant railway guns. Some of these had some sort of rationale as siege weapons, being often employed as a sort of super ‘bunker buster’ to demolish large concrete fortifications, but the Third Reich seems to have had some form of fixation with building bigger and bigger guns (or perhaps Krupps had a fixation with bigger and bigger contracts). This reached its culmination with Gustav (named after the then head of Krupps). Gustav was an 800mm (32 inch) railway gun. Whereas K-12 had been designed to fire a relatively small amount of explosive a very long way Gustav propelled a very large amount of explosive a relatively short distance. Gustav’s big concrete piercing shell weighed some 7 tons and could be sent some 15 miles (24 kilometres). It was about the same size as the British tallboy bomb (which was intended to perform much the same function) but whereas a squadron of tallboy carrying Lancasters had a range of hundreds of miles and could be deployed at short notice. Gustav was huge and had to travel in sections being assembled at its firing site. This required parallel sets of railway track to be laid as the complete equipment effectively straddled two huge railway bogie platforms. The gun could take weeks to reach its firing position and a further three weeks to be set up. This was hardly blitzkrieg. Its crew and support organisation numbered nearly 2,000 men under the command of a Major General. Only one Gustav was built although at least one spare barrel existed along with parts of the carriage assembly. There was once thought to have been a second gun – Dora but this was in fact merely Gustav called by a different name, Dora being its crew’s pet name for the monster. 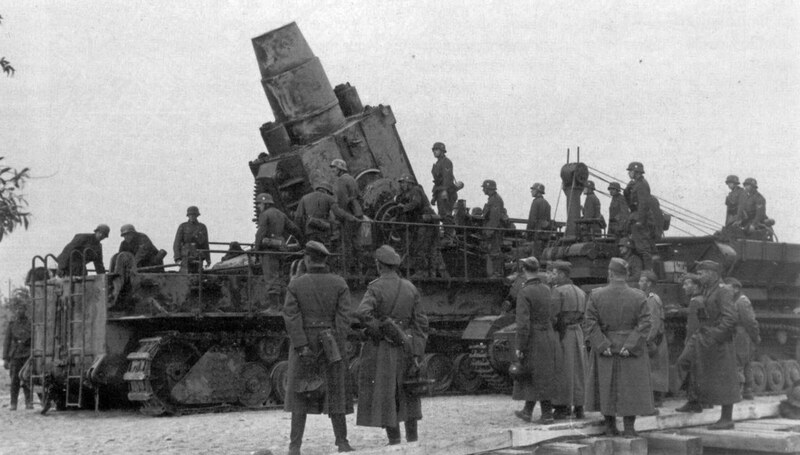 Gustav was used at the siege of Sebastopol where it fired some 40 shells and demolished a Soviet strong point. Far more effective in the same siege were two self propelled heavy 600mm (24inch) howitzers (effectively a kind of mobile Big Bertha) nicknamed Karl and Votan. These were designed so that they could be suspended between two railway bogies for long distance travel and moved on caterpillar tracks for short distances on the battle field. They cost a fraction of the resources dedicated to Gustav and were far more flexible. 16 more such weapons were built. Gustav’s only other outing was to the siege of Warsaw in 1944 where it fired some 30 shells. These may have added to the suffering of the Polish defenders but it is difficult to see what strategic or tactical advantage it brought to the German forces. Gustav vanished after this and after the war the Allies found only various spare components, the monster gun had seemingly evaporated. When Gustav was first completed Adolph Hitler attended a demonstration firing. It appears that he was most impressed and suggested that perhaps it could be used as a long range anti tank weapon. If any of the German high command still retained any illusions about their fuhrer’s grasp of reality their faith must have been severely weakened that day. Nevertheless a design study was set in motion to look at the possibility of a self propelled Gustav. This came up with a design in which the massive gun and carriage would be mounted on a number of Tiger tank bodies, armour attached to the firing platform, elevation restricted so turning the whole contraption into the Worlds largest assault gun. A further tracked design was intended to turn the monster into a street-fighting machine. The P1500 project was another attempt to achieve a self propelled Gustav, Hitler’s armaments minister Albert Speer dubbed this “the monster” and was probably responsible for ending any hopes of Gustav development, the Third Reich just couldn’t afford it. Had any of these been built and deployed they would have been enormous, slow, unmanoeuvrable and highly vulnerable targets quickly pounded into ruin by every Allied anti tank gun and field gun for miles around. In any case none of them would have been able to cross a river of significant depth and width being far too big and heavy for the bridges and without any fording ability. The German obsession with firing relatively small amounts of explosive over very long distances showed itself again and suggestions were made that Gustav’s barrel be tubed and extended to produce yet another variation on the Paris Gun and the K-12. This was not proceeded with. There is some evidence that both the K-12 and Gustav projects were the results of initiatives from Krupps (who eventually built them). If so the Allies should be grateful to whoever’s idea they were. The amount of resource and effort diverted from the German war effort to produce and deploy these essentially useless weapons must have been prodigious. So far as anyone knows, it fired a couple of dozen shells at the fortresses around Sevastopol with outstanding results and then disappeared completely. I agree that it was a monumental example of going too far. So was the Karl Morser 600mm mortar, for that matter. "Bigger is better" does not always apply to weapon systems. However, they would have unquestionably breached the Maginot Line had they been needed to, but at an incredibly wasteful cost in labor, materials, men and money. And this brings us nicely around to the Armstrong muzzle loader in question - a dinosaur but the inevitable end of a line of development pushed too far. Reminds me of the developmental line of AA guns the reached the pinnacle of obsolesence with Green Mace, a five inch AA weapon with a rate of fire of 75 rounds per minute,) but only 28 round magazine capacity and needed a crew and a crane to reload). Or the evolution of the super tanks, ending with America's T-28 and Britain's version. America did the same thing, with the entire 8" series of SP and towed weapons and the companion 240 mm weapons. Ultimately they fired a atomic artillery shell from one of them, but it was surpassed by better technology almost immediately, and the caliber was scaled back to a perfectly adequate 155mm standard that accomplishes the same thing more efficiently and faster. I won 't even get into the dinosaur trend in naval vessels, that led to the monsters Hitler was planning and the ones Japan actually built. And then there was the Soviet Union, which claimed to have tested a nuclear weapon - the Tzar Bomba with an actual rating of 100 megatons and which was detonated at 57 megatons. What kind of a target is worth the cost and effort of hauling a 100 megaton weapon all the way to America when a smaller weapon is just as devastating and far easier to lug around? So in the end, it seems natural for humans to push to weapons their limits of practicality and beyond their limits of uselessness - a Peter Principle of weapons if you will. No wonder women think we're obsessed with size.! Utterly wrong. K-12 was a Paris gun update intended for the bombardment of cities from a long range as were a number of other large weapons. Apart from Gustav what other large weapons for Maginot line busting weapons were ordered please? The series of "self propelled" 60 and 54cm mortars of the Karl series. These were ordered for the same purpose: Busting the Maginot Line. The K-12M was later and not intended for that purpose. It was too small a weapon at 21 cm. All times are GMT-5. This page was generated at 07:01.